vdiffr is an extension to the package testthat that makes it easy to test for visual regressions. It provides a Shiny app to manage failed tests and visually compare a graphic to its expected output. Important: The CRAN version no longer works properly. Please use the development version which removes the dependency on the system FreeType library. Add expectations to by including expect_doppelganger() in your test files. Run manage_cases() to generate the plots which vdiffr will test against in the future. This will launch a shiny gadget which will ask you to confirm that each plot is correct. Run devtools::test() to execute the tests as normal. When a figure doesn't matched the saved version, vdiffr signals a failure when it is run interactively, or when it is run on Travis or Appveyor. Mismatches do not cause R CMD check to fail on CRAN machines. See the testing versus monitoring section below. A title. This title is used in two ways. First, the title is standardised (it is converted to lowercase and any character that is not alphanumeric or a space is turned into a dash) and used as filename for storing the figure. Secondly, with ggplot2 figures the title is automatically added to the plot with ggtitle() (only if no ggtitle has been set). A figure. This can be a ggplot object, a recordedplot, a function to be called, or more generally any object with a print method. Optionally, a path where to store the figures, relative to tests/figs/. They are stored in a subfolder according to the current testthat context by default. Supply path to change the subfolder. Note that in addition to automatic ggtitles, ggplot2 figures are assigned the minimalistic theme theme_test() (unless they already have been assigned a theme). Check how a failed case differs from its expected output using three widgets: Toggle (click to swap the images), Slide and Diff. If you use Github, you may be familiar with the last two. Validate cases. You can do so groupwise (all new cases or all failed cases) or on a case by case basis. When you validate a failed case, the old expected output is replaced by the new one. Delete orphaned cases. During a refactoring of your unit tests, some visual expectations may be removed or renamed. This means that some unused figures will linger in the tests/figs/ folder. These figures appear in the Shiny application under the category "Orphaned" and can be cleaned up from there. Both manage_cases() and collect_cases() take package as first argument, the path to your package sources. This argument has exactly the same semantics as in devtools. You can use vdiffr tools the same way as you would use devtools::check(), for example. The default is ". ", meaning that the package is expected to be found in the current folder. All validated cases are stored in tests/figs/. This folder may be handy to showcase the different graphs offered in your package. You can also keep track of how your plots change as you tweak their layout and add features by checking the history on Github. You can run the tests the usual way, for example with devtools::test(). New cases for which you just wrote an expectation will be skipped. Failed tests will show as an error. When the NOT_CRAN environment is set. In particular, devtools sets this when running the tests interactively. On Travis, Appveyor, or any environment where the Sys.getenv("CI") is set. Otherwise, the failure is ignored. The motivation for this is that vdiffr is a monitoring tool and shouldn't cause R CMD check failures on the CRAN machines. Checking the appearance of a figure is inherently fragile. It is a bit like testing for errors by matching exact error messages. These messages are susceptible to change at any time. Similarly, the appearance of plots depends on a lot of upstream code, such as the way margins and spacing are computed. vdiffr uses a special ggplot2 theme that should change very rarely, but there are just too many upstream factors that could cause breakages. For this reason, figure mismatches are not necessarily representative of actual failures. Visual testing is not an alternative to writing unit tests for the internal data transformations performed during the creation of your figure. It is more of a monitoring tool that allows you to quickly check how the appearance of your figures changes over time, and to manually assess whether changes reflect actual problems in your packages. If you want vdiffr to fail on CRAN machines as well, just set the environment variable CI to "true" in a setup-vdiffr.R file in your testthat folder. An addin to launch manage_cases() is provided with vdiffr. Use the addin menu to launch the Shiny app in an RStudio dialog. Some of the plot components depend on random variation. Try setting a seed. The plot depends on some system library. For instance sf plots depend on libraries like GEOS and GDAL. It might not be possible to test these plots with vdiffr (which can still be used for manual inspection, add a [testthat::skip()] before the expect_doppelganger() call in that case). To help you understand the causes of a failure, vdiffr automatically logs the SVG diff of all failures when run under R CMD check. The log is located in tests/vdiffr.Rout.fail and should be displayed on Travis. You can also set the VDIFFR_LOG_PATH environment variable with Sys.setenv() to unconditionally (also interactively) log failures in the file pointed by the variable. vdiffr extends testthat through a custom Reporter. Reporters are classes (R6 classes in recent versions of testthat) whose instances collect cases and output a summary of the tests. While reporters are usually meant to provide output for the end user, you can also use them in functions to interact with testthat. vdiffr has a special reporter that does nothing but activate a collecter for the visual test cases. collect_cases() calls devtools::test() with this reporter. When expect_doppelganger() is called, it first checks whether the case is new or failed. If that's the case, and if it finds that vdiffr's collecter is active, it calls the collecter, which in turns records the current test case. This enables the user to run the tests with the usual development tools and get feedback in the form of skipped or failed cases. On the other hand, when vdiffr's tools are called, we collect information about the tests of interest and wrap them in a data structure. Comparing SVG files is convenient and should work correctly in most situations. However, SVG is not suitable for tracking really subtle changes and regressions. See vdiffr's issue #1 for a discussion on this. vdiffr may gain additional comparison backends in the future to make the tests more stringent. This release of vdiffr features a major overhaul of the internals to make the package more robust. svglite is now embedded in vdiffr to protect against updates of the SVG generation engine. It also embeds harfbuzz to compute font extents and text boxes metrics. This makes SVG generation of text boxes consisent across platforms. While this makes vdiffr much more robust, it also means you will have to regenerate all your testcases with the new version of vdiffr. You can expect very few future releases that will require updating figures, hopefully once every few years. Now that vdiffr has a stable engine, the next release will focus on improving the Shiny UI. Another important change is that figure mismatches are no longer reported as failures, except when the tests are run locally, on Travis, Appveyor, or any environment where the Sys.getenv("CI") or Sys.getenv("NOT_CRAN") variables are set. Because vdiffr is more of a monitoring than a unit testing tool, it shouldn't cause R CMD check failures on the CRAN machines. Despite our efforts to make vdiffr robust and reliable across platforms, checking the appearance of a figure is still inherently fragile. It is similar to testing for errors by matching exact error messages: these messages are susceptible to change at any time. Similarly, the appearance of plots depends on a lot of upstream code, such as the way margins and spacing are computed. vdiffr uses a special ggplot2 theme that should change very rarely, but there are just too many upstream factors that could cause breakages. For this reason, figure mismatches are not necessarily representative of actual failures. Visual testing is not an alternative to writing unit tests for the internal data transformations performed during the creation of your figure. It is more of a monitoring tool that allows you to quickly check how the appearance of your figures changes over time, and to manually assess whether changes reflect actual problems in your package. If you need to override the default vdiffr behaviour on CRAN (not recommended) or Travis (for example to run the tests in a particular builds but not others), set the VDIFFR_RUN_TESTS environment variable to "true" or "false". vdiffr now advises user to run manage_cases() when a figure was not validated yet (#25). Fixed a bug in the Shiny app that prevented SVGs from being displayed in Firefox (@KZARCA, #29). manage_cases() gains an options argument that is passed to shiny::shinyApp() (@KZARCA). The Shiny app now has a quit button (@ilarischeinin). New VDIFFR_LOG_PATH environment variable. When set, vdiffr pushes diffs of failed SVG comparisons to that file. expect_doppelganger() now takes a writer argument. This makes it easy to use vdiffr with a different SVG engine. See ?write_svg for an example function. Packages implementing a different SVG engine should wrap around expect_doppelganger() to pass their custom writer. write_svg() is now an exported function. It provides a template (function arguments and return value) for SVG writer functions. The verbose argument of expect_doppelganger() is soft-deprecated. Please use the vdiffr failure log instead. It is created automatically when run under R CMD check in tests/vdiffr.Rout.fail, and should be displayed on Travis. add_dependency() is soft-deprecated without replacement. The user_fonts argument of expect_doppelganger() is defunct because it complicated the UI for no clear benefit. The fonts used to generate the SVGs are now hardcoded to Liberation and Symbola. Maintenance release to fix CRAN errors. Thanks to Gregory R. Warnes (@gwarnes-mdsol) and Hiroaki Yutani (@yutannihilation) for helping out with this! I'm working on embedding svglite in vdiffr and compiling statically to FreeType and Harfbuzz to make SVG generation deterministic across platforms. Until then vdiffr will remain a bit unstable (but should silently fail if dependencies have diverged). Use last_collection_error() to print a testthat error that occurred while collecting the test cases. Skip tests if the system version of Cairo (actually the one gdtools was compiled with) doesn't match the version of Cairo used to generate the testcases. Cairo has an influence on the computation of text metrics which can cause spurious test failures. We plan to fix these issues once and for all by embedding gdtools, svglite, Cairo and FreeType in the vdiffr package. This release fixes some CRAN failures. Test cases of the mock package were updated to FreeType 2.8.0. The unit test log file from the mock package is now preserved. This release makes it easier to debug failures on remote systems. It also makes vdiffr more robust to failures caused by incompatible installations: instead of failing, the tests are skipped. This prevents spurious failures on CRAN. expect_doppelganger() gains a verbose argument to print the SVG files for failed cases while testing. This is useful to debug failures on remotes. When tests are run by R CMD check, failures are now recorded in a log file called vdiffr.fail. This file will show up in the Travis log and can be retrieved from artifacts on Appveyor. It includes the SVG files for failed cases, which is useful to debug failures on remotes. The tests are now skipped if the FreeType version used to build the comparison SVGs does not match the version installed on the system where the tests are run. This is necessary because changes in new version of FreeType might affect the computation of text extents, which then causes svglite to produce slightly different SVGs. The minor version is not taken into account so FreeType 2.7.1 is deemed compatible with 2.7.2 but not with 2.8.0. In practice, this means that package contributors should only validate visual cases if their FreeType version matches the one of the package maintainer. Also, the maintainer must update the version recorded in the package repository (in the file ./tests/figs/deps.txt) when FreeType has been updated on their system. Running vdiffr::validate_cases() updates the dependency file even if there are no visual case to update. In the future, we may provide a version of vdiffr statically compiled with a specific version of FreeType to prevent these issues. The minimal R version required by vdiffr is now R 3.1.0.
expect_doppelganger() no longer throws an error when FreeType is too old. Instead, the test is skipped. This ensures that R CMD check passes on those platforms (e.g., CRAN's Solaris test server). Depends on gdtools 0.1.2 or later as this version fixes a crash on Linux platforms. 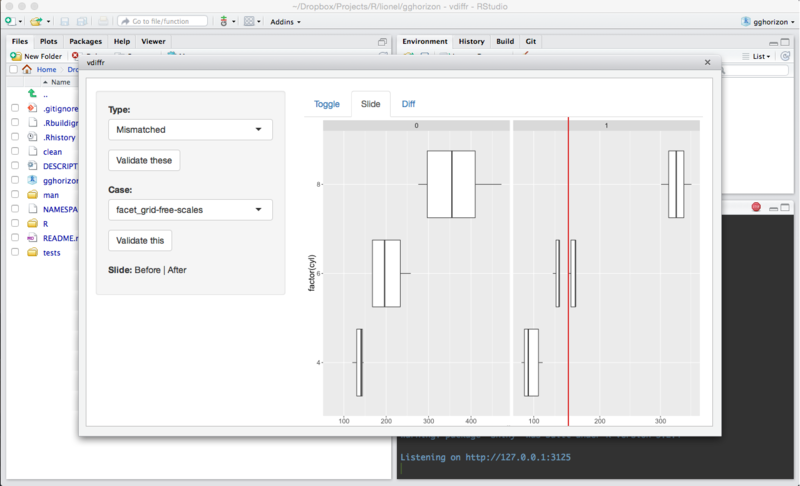 widget_toggle(), widget_slide() and widget_diff() now take plots as arguments. This makes it easy to embed a vdiffr widget in R Markdown documents. The underscored versions take HTML sources as argument (paths to SVG files or inline SVGs). Generated SVGs are now reproducible across platforms thanks to recent versions of svglite, gdtools, and the new package fontquiver. vdiffr now requires versions of FreeType greater than 2.6.1. The figures folder is hardcoded to tests/figs/. The figures are now stored in subfolders according to the current testthat context. expect_doppelganger() accepts the path argument to bypass this behaviour (set it to "" to store the figures in tests/figs/). The title argument of expect_doppelganger() now serves as ggtitle() in ggplot2 figures (unless a title is already set). It is also standardised and used as filename to store the figure (spaces and non-alphanumeric characters are converted to dashes). Add support for handling orphaned cases: you can now remove figures left over from deleted tests with delete_orphaned_cases() or from the Shiny app. New filter argument to collect_cases() and manage_cases(). This lets you filter the test files from which to collect the cases, which is useful to speed up the collection for large codebases with a lot of unit tests. Give a warning when multiple doppelgangers have the same name (#4).